Her boss, concerned about his employee's well being, asks sympathetically, "What's the matter?" The blonde replies, "Early this morning I got a phone call saying that my mother had passed away." "I'm terribly sorry to hear that. Just take the day off to relax and rest." The blonde very calmly explains, "No, I'd be better off here. I need to keep my mind off it and I have the best chance of doing that here." The boss agrees and allows the blonde to work as usual. "If you need anything, just let me know," he says. 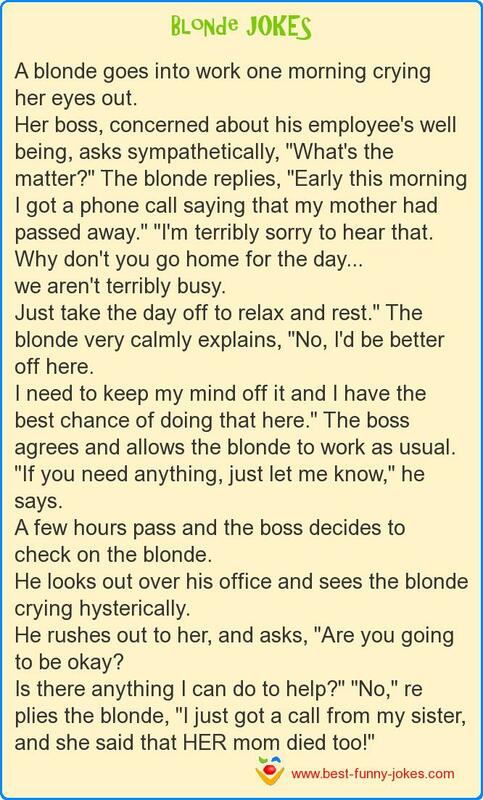 A few hours pass and the boss decides to check on the blonde. He rushes out to her, and asks, "Are you going to be okay? Is there anything I can do to help?" "No," re plies the blonde, "I just got a call from my sister, and she said that HER mom died too!"